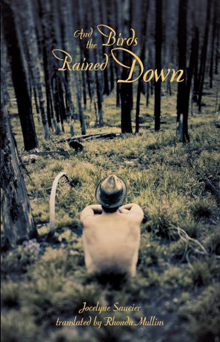 And The Birds Rained Down by Jocelyn Saucier (Coach House Books, 2012) – Deep in a Northern Ontario forest live Tom and Charlie, two octogenarians determined to live out the rest of their lives on their own terms: free of all ties and responsibilities, their only connection to civilization two pot farmers who bring them whatever they can’t eke out for themselves. But their solitude is disrupted by the arrival of two women. The first is a photographer searching for survivors of a series of catastrophic fires nearly a century earlier; the second is an elderly escapee from a psychiatric institution. The little hideaway in the woods will never be the same. Originally published in French as Il pleuvait des oiseaux, And the Birds Rained Down, is a haunting meditation on aging and self-determination. The book has received several prestigious prizes, including the Prix de Cinq Continents de la Francophonie and was a finalist for the 2013 Governor General’s Literary Award for French-to-English Translation. And The Birds Rained Down will be championed by singer-songwriter Martha Wainwright. 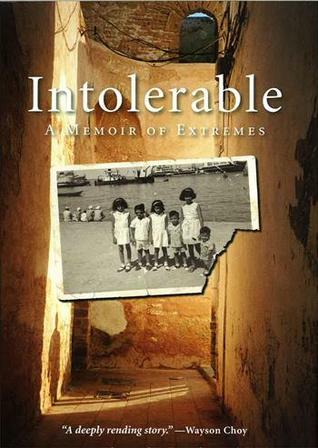 Intolerable: A Memoir of Extremes by Kamal Al-Solaylee (HarperCollins Canada, 2013) – In the 1960s, Kamal Al-Solaylee’s father was one of the wealthiest property owners in Aden, in the south of Yemen, but when the country shrugged off its colonial roots, his properties were confiscated and the family of twelve was forced to leave. They moved first to Beirut, where sectarian violence began to tear the country apart, and then to Cairo. After a few peaceful years, even the safe haven of Cairo struggled under a new wave of Islamic extremism that culminated in the assassination of Anwar Sadat in 1981. The family returned to Yemen, a country that was by then culturally isolated from the rest of the world. Kamal’s father, Mohamed, always impeccably dressed as he sought to provide for his itinerant family, would remain largely unemployed as his influence waned. Kamal’s mother, Safia, the illiterate daughter of a Yemeni shepherdess, struggled at first to adjust to her new life yet demonstrated a remarkable ability to adapt. But Kamal, caught between the cultural and religious changes in the Middle East and the allure of the West, found himself with few choices for survival. As a gay man living in an intolerant country, Al-Solaylee escaped first to England and eventually to Toronto, Canada, where he became a prominent journalist and academic. Intolerable will be championed by Kristin Kreuk, actor (Beauty and the Beast, Smallville). 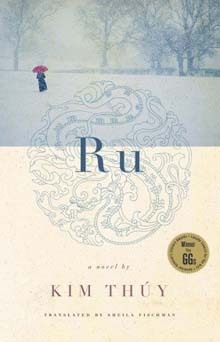 Ru by Kim Thúy (Penguin/Random House Canada, 2012) – Ru. In Vietnamese it means lullaby; in French it is a small stream, but also signifies a flow–of tears, blood, money. Kim Thúy’s Ru is literature at its most crystalline: the flow of a life on the tides of unrest and on to more peaceful waters. In vignettes of exquisite clarity, sharp observation and sly wit, we are carried along on an unforgettable journey from a palatial residence in Saigon to a crowded and muddy Malaysian refugee camp, and onward to a new life in Montreal, Quebec. There, the young girl feels the embrace of a new community, and revels in the chance to be part of the American Dream. As an adult, the waters become rough again: now a mother of two sons, she must learn to shape her love around the younger boy’s autism. Moving seamlessly from past to present, from history to memory and back again, Ru is a book that celebrates life in all its wonder: its moments of beauty and sensuality, brutality and sorrow, comfort and comedy. Ru was a 2012 finalist for the Scotiabank Giller Prize and the Man Asian Literary Prize. It won the Governor General’s Award for French-Language Fiction in 2010, and the Prix du Grand Public Salon du Livre de Montréal. Ru will be championed by Cameron Bailey, Artistic Director of the Toronto International Film Festival. The Inconvenient Indian: A Curious Account of Native People in North America by Thomas King (Doubleday Canada, 2013) – Rich with dark and light, pain and magic, The Inconvenient Indian distills the insights gleaned from Thomas King’s critical and personal meditation on what it means to be “Indian” in North America, weaving the curiously circular tale of the relationship between non-Natives and Natives in the centuries since the two first encountered each other. In the process, King refashions old stories about historical events and figures, takes a sideways look at film and pop culture, relates his own complex experiences with activism, and articulates a deep and revolutionary understanding of the cumulative effects of ever-shifting laws and treaties on Native peoples and lands. This is a book both timeless and timely, burnished with anger but tempered by wit, and ultimately a hard-won offering of hope–a sometimes inconvenient but nonetheless indispensable account for all of us, Indian and non-Indian alike, seeking to understand how we might tell a new story for the future. 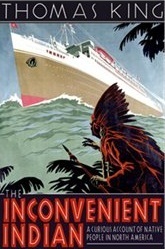 The Inconvenient Indian will be championed by activist and social entrepreneur Craig Kielburger. 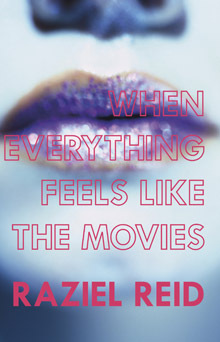 When Everything Feels Like The Movies by Raziel Reid (Arsenal Pulp Press, 2014) – School is just like a film set: there’s The Crew that make things happen, The Extras who fill the empty desks, and The Movie Stars, whom everyone wants tagged in their Facebook photos. But Jude doesn’t fit in. He’s not part of The Crew because he isn’t about to do anything unless it’s court-appointed; he’s not an Extra because nothing about him is anonymous; and he’s not a Movie Star because even though everyone know his name like an A-lister, he isn’t invited to the cool parties. As the director calls action, Jude is the flamer that lights the set on fire. Before everything turns to ashes from the resulting inferno, Jude drags his best friend Angela off the casting couch and into enough melodrama to incite the paparazzi, all while trying to fend off the haters and win the heart of his favourite co-star Luke Morris. It’s a total train wreck! But train wrecks always make the front page. When Everything Feels Like The Movies is Raziel Reid’s debut novel and the recipient of the 2014 Governor General’s Literary Award for Children’s Literature. It is the first young adult novel to be a finalist in Canada Reads and will be championed by Elaine “Lainey” Lui, entertainment reporter and co-host of The Social. Canada Reads was launched in 2001 by the Canadian Broadcasting Corporation (CBC) as an annual battle of books where, through a process of direct reader participation and based on a specific theme, a long list of books by Canadian authors is initially selected and then eliminated by vote until a short list of five books remains. These books are then championed by a panel of five prominent Canadians. Each of the champions selects a book to defend as their chosen in a series of debates, and the books are eliminated one by one until a winner is declared. This year’s Canada Reads debates will be hosted by Wab Kinew, musician, broadcaster and university administrator, who successfully defended Joseph Boyden’s The Orenda winner of Canada Reads 2014. The debates will be broadcast on CBC television and radio in March 2015. Each year I await the announcement of the Canada Reads long list and finalists to inform my reading list. This year I hope to read and post my thoughts on all five books before the debates begin. Congratulations and best of luck to all the nominees. This entry was posted in Canadian Literature, Fiction, Historical, Indie Reviews, Indigenous, LGBTQ, Memoirs, Non-Fiction, Political, Reading Round Up and tagged Arsenal Pulp Canada, Canada Reads 2015, Coach House Books, Doubleday Canada, HarperCollins Canada, Jocelyne Saucier, Kamal Al-Solaylee, Kim Thúy, Random House Canada, Raziel Reid, Thomas King by Indie Reviews. Bookmark the permalink. Suddenly, my to-read list got longer. These all sound awesome! Between the GGs Literary Award, the Giller Prize for Fiction and Canada Reads, my reading list is beyond long. I’m stoked though about this year’s finalists and looking forward to the reads. I bet those debates are fun to watch! I’m so glad Reid’s book made it to the final 5. But, as I read the summaries, all the books sound great, Indie. In January I’ve read books that go hand in hand with 3 of the other 4 on that list. I’m getting samples for my Kindle (if available) checking them out to see if I am interested. I’m also thrilled that Reid’s book made the final 5 (I had a feeling it would though because it won the GGs Lit Award in 2014). I’m looking forward to reading all the books. In addition to broadcasting the debates on television and radio, the CBC also live streams them. I’ll be sure to send you the link. The debates are scheduled for March 16-19, 2015. Thanks Indie. I would love to listen/watch the debates!